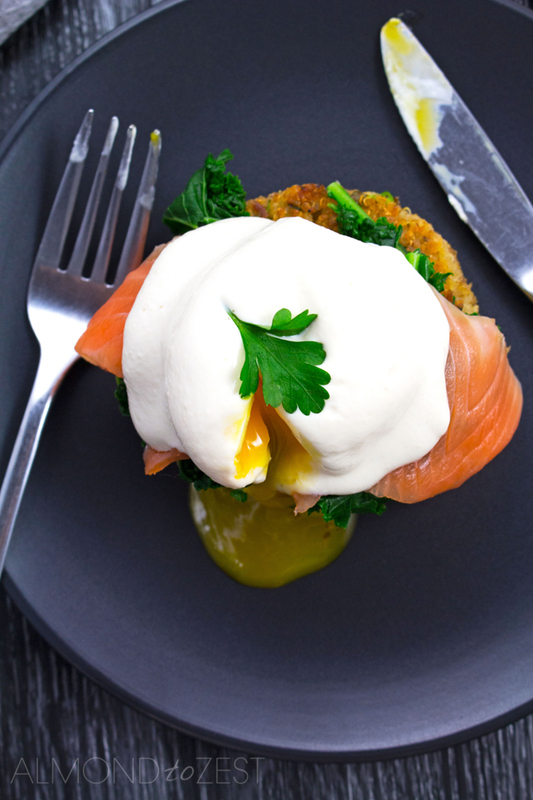 Now you can eat Poached Eggs Benedict all the time with my healthy superfood version, stacked with Quinoa, Kale, Smoked Salmon and Tahini. Once upon a time Poached Eggs Benedict would have been one of my all time favorite breakfast foods. Hands down. No other café dish could quite compare to the indulgence and satisfaction that was had when stuffing my mouth with a forkful of all things breakfasty drenched in a rich, buttery, lemony hollandaise sauce. But times have changed. And now I find myself opting for the healthier kinda dish. The think about your body kinda dish. And most importantly the think about what that’s going to DO to your waistline kinda dish. But even though times have changed my love for Eggs Benny has not. So I decided I would have to create my own healthy version. One that I can indulge in more often than not. One that is still packed with all the tastiness of an Eggs Benedict but without all the naughtiness. And here you have it my Superfood Poached Eggs Benedict. 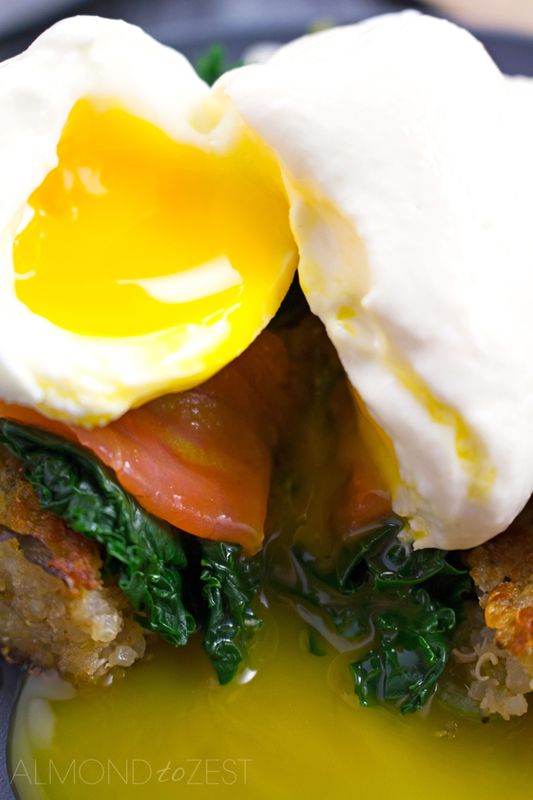 So lets start from the bottom of this breakfast stack, the quinoa patty. This power packed superfood is something we should all be eating more of. And if you want to know why check out my post on QUINOA NUTRITION it will fill you in on the amazing benefits this stuff has to offer. Delicate, sweet, fluffy and nutty, the flavor and texture of the quinoa makes it the perfect replacement for the usual bready base used. 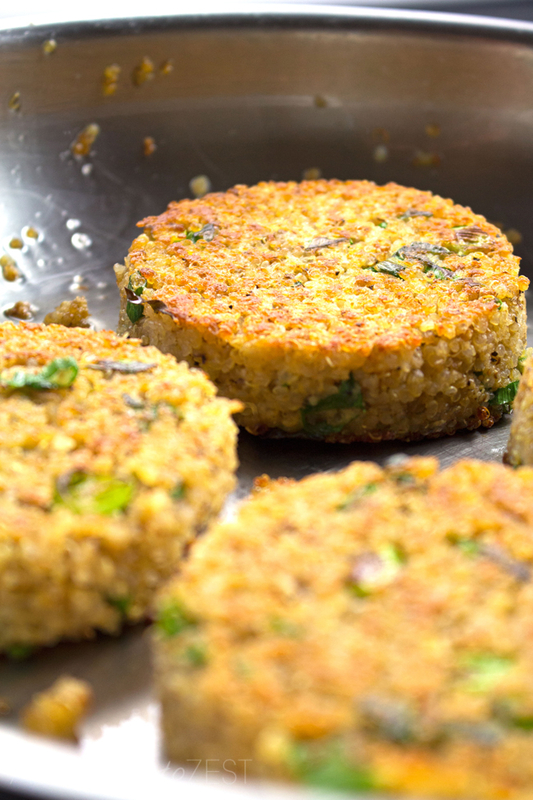 By gently frying these patties a crispy outer layer is created, giving a fantastic contrast in texture. And to add extra flavor I sprinkled in thin slices of green onions. On top of this goes a layer of vibrant green kale, one of the healthiest vegetables around. And if kales not your thing then spinach will do the job. Not much changes with the next two levels. Layers of omega rich smoked salmon and a perfectly poached free range egg. 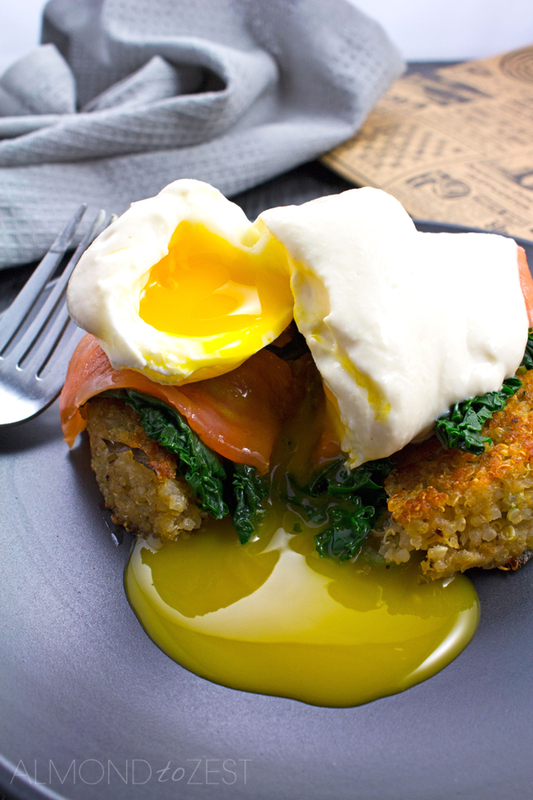 The final addition to this superfood benny was the hardest to replace. I mean how do you make a healthy sauce that can compare to hollandaise. Impossible right? Well yes, but I think my tahini-enriched lemon yogurt sauce was a pretty good compromise. The flavors match the rest of the stack perfectly. Now for the best part, the part where you grab your knife and gently cut open the perfectly poached egg and watch the yolk ooze out. Heaven. 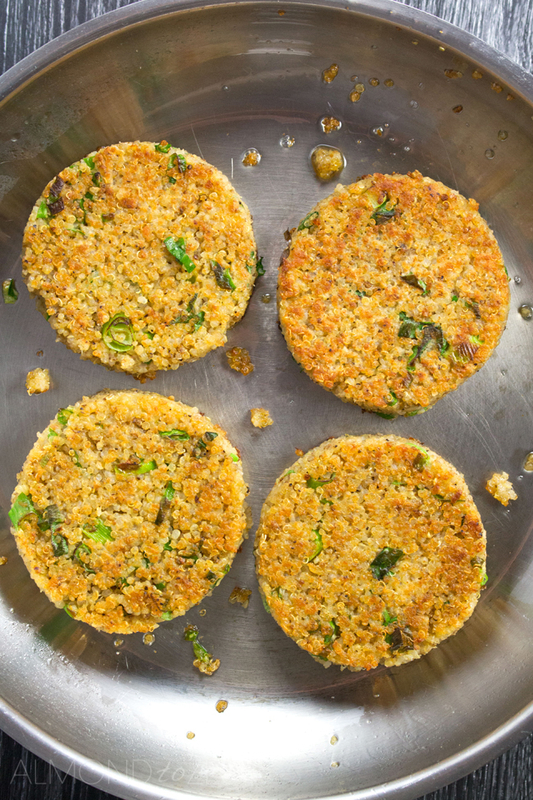 For this recipe I usually make the quinoa patties first then put them in a warm oven whist I prepare the rest of the dish. Heat oven to 210 (100C). Prepare the quinoa patties. In a mixing bowl add the cooked quinoa, chopped scallion leaves, free-range eggs and wholegrain breadcrumbs. Mix well and season with salt. Using a 3¼ “ (8cm) diameter cookie ring or similar, firmly press and mould the mixture into 6 patties. Heat the olive oil in a fry pan over a medium to high heat. Using a spatula transfer the patties to the fry pan. Gently shake the fry pan back and forth as the patties begin to sear to ensure they don’t stick. Cook for 3-4 minutes on each side until golden brown. Transfer to a tray and place in warm oven. Prepare the tahini yogurt. Place the yogurt, tahini and lemon juice in a small mixing bowl and whisk together. Season with salt. Bring 2 medium saucepans of water to the boil. One is to poach your eggs and one is to blanch your kale leaves. Drop the kale leaves into one of the saucepans and blach for 1 minute, strain and squeeze out the water with your hands. Add the white vinegar to the other saucepan. Reduce the pot to a simmer and using a whisk create a whirlpool and crack the eggs into the center. Poach eggs for around 3 minutes for soft yolks. Remove with a slotted spoon and place on a clean dish cloth or paper towel to dry. 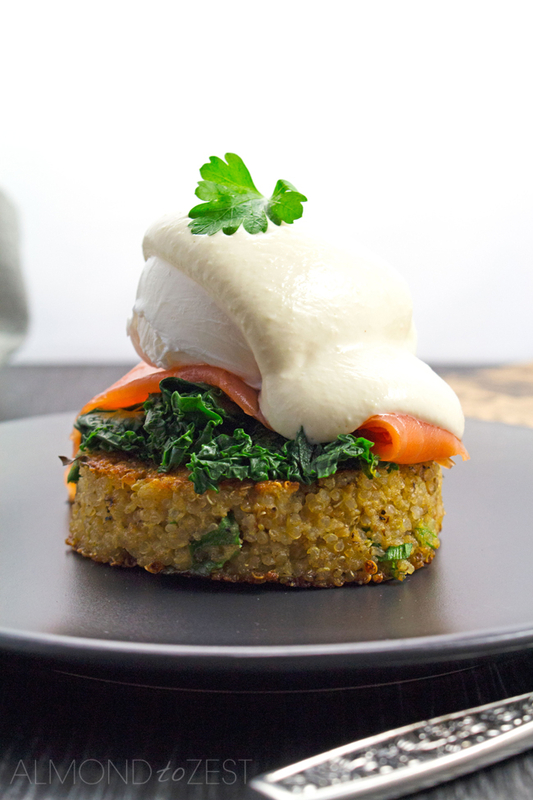 To assemble place a quinoa patty on a plate, top with the blanched kale, smoked salmon and a poached egg. Spoon over the tahini yougurt.